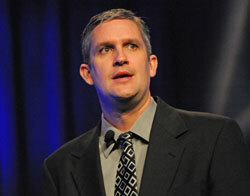 Today’s general session featured National Biodiesel Board Chairman Ed Hegland. He’s completing his final term as Chairman. Ed pointed out that there are members of all segments of the petroleum industry here today and they participated in a panel discussion after his comments. I’ll post that shortly. He presented some of the findings from a research study done by NBB on consumers and their awareness and perceptions of biodiesel. He says the study finds that consumers who are aware of biodiesel have a favorable opinion of it. He also talks about being a soybean farmer and the incredible technology that is allowing him to grow more with less.